Written by Natalie, one of our Obby Insiders. Insiders review all new classes to make sure they are as extraordinary as we intend them to be, so you know you are always getting a great experience when buying from Obby. I would describe myself as a textile crafter/wannabe crafter- sewing and felting with a soft spot for cute animals and creatures. More of a sit on a rocking chair on a crochet blanket than a hunched over a bench with a tool belt and an expensive waxed cotton apron sort. Pottery seems in my head more of the latter end of the craft spectrum, serious, technical and something that I may not slot into quite so easily. After seeing some adorable ceramic figurines on Instagram and all the cool uneven dishevelled looking mugs in trendy shops in Peckham I thought perhaps I should give it a go. Just on the edge of Burgess park ‘Art in the park’ is situated. A couple of knocks on the door and we were greeted by Suzy one of the workshop teachers. Looking around it was inspiring and I began to get excited about what I was going to learn. Pots and figures lined shelves and imprinted tiles covered parts of the wall. It was a well used space and a liberating typical art workshop messy looking place which reminds you of the possibilities when you loosen up a bit and don’t worry so much about the clean up at the end. Leader of the class was Nam, ceramicist and who I later found out was a contestant of The Great Pottery Throwdown. We were first all talked through the two stages of the class and Nam made both techniques look effortlessly smooth and easy. I had the same feeling I always get when I try a new crafty thing of ‘maybe THIS will be my hidden talent’ unfortunately this thought was quickly quashed. Nam’s techniques on the wheel looked like some sort of Tai Chi, pushing and gripping with such concentration and then with one grasp of the hand (well thats what it seemed) suddenly boom he released his hands to reveal a perfect symmetrical pot. We all were then heartbroken when he screwed it up into a brown sloppy blob, like watching a waitress taking away your plate of food before you had finished. The other part of the class was coiling, of which I had no idea what it meant. Coiling is the hand building technique that doesn’t need an electric wheel. You roll long sausages out of the clay which then you coil upwards like a slinky to give the pot your making height. My group did throwing first which I was glad about as I was sure I would have forgotten all the techniques Nam had just told us after about 5 minutes. Nam was friendly and firm and went through it all with us as we were spinning the wheel. Relaxation and concentration are the key to success with throwing, two things that I’m not the best at. We threw one pot with a lot of guidance- (great!) and then Nam came round each of us and in a kind of Bruce Almighty moment transformed our piles of clay into beautiful pots. The second pot we were on our own. The stress mounted but I remembered I had to try and stay calm, breathe and work with the pot. All I thought was going pretty well I had a rhythm but my eyes spotted one of Nam’s Ego men (giant cast ceramic lego men) and whilst thinking about how great this idea was I had lost my concentration and suddenly like a spinning top loosing momentum my pot spiralled out of my control. My foray into hand building seemed to be a bit more of a success although my calmness of finishing throwing meant I was a bit too relaxed and ended up rushing a bit towards the end. I did however manage to quickly scribble a face onto the outside and therefore in my head add some professionalism to my bowl. 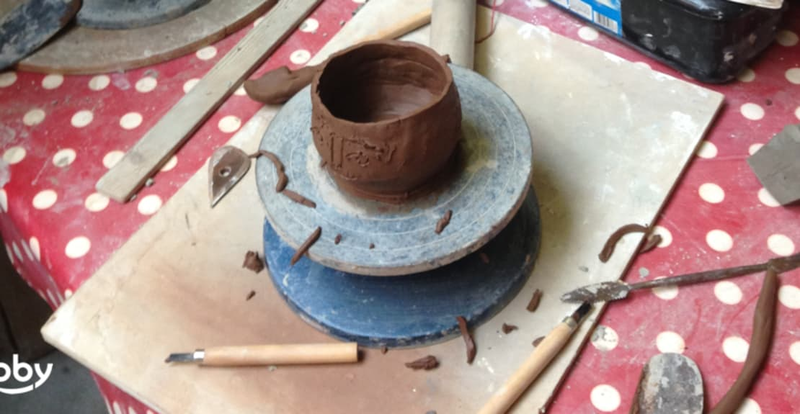 So my collapsed thrown pot and my scribbled face pot are sitting pretty at Nam’s and I excitedly await making the journey to Bermondsey to pick it up. For anyone who wants to be thrusted into pottery and given a crash course this is perfect. It has definitely wet my appetite for further ceramics, although next time I may stick to hand building.